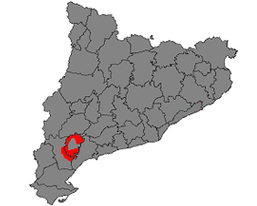 Located in the province of Tarragona (Catalonia, Spain) and covers 12 municipalities. Regional approval came in 2001, and from 2002 wines were sold as Montsant rather than Tarragona. Montsant takes its name from the Montsant mountains in the area. Soil: are lime bearing over a granite and slate subsoil. Climate: strong contrast of temperatures at the mountain zones. White are chardonnay, white garnacha, macabeo, moscatel, pansal, parellada. Red are cabernet sauvignon, carinena, tint garnacha, peluda garnacha, merlot, monatrell, picapoll, syrah, tempranillo and mazuela. Wines: are very refreshing, minerals and expressive. White are much seen from garnacha blanca which you can obtain wines with body and certain structure. The ones produce using macabeo are lighter and smoother, fresh and fruity. Rosé are usually produced using garnacha. They are tasty and fruity, corporeal but they are very nice and have a good definition of the red fruits. Red are the most popular from this D.O. The jovenes wines are dark, fruity, fleshy and tasty. The best samples are the ones grown in wood which are powerful, fleshy and high in alcohol. It can be found mineral notes and be similar to the wines from Priorat.